Hope Engaged: A Nepali Give-away! In all my travels, there have been very few times I have been tempted to buy many souvenirs. "oh, I can't wait to display this horribly painted figurine of the Leaning Tower of Pisa on my mantel!" "what the heck am I going to do with this gigantic chinese mandolin I don't know how to play and that will collect dust in my living room corner until I give it away to goodwill, where no one will buy it!?!" "I swear I saw that scarf in Italy. And in Kenya. And in Costa Rica....what the heck!" however...I have been blown away by the items here in Nepal. They are gorgeous, useful, and incredibly original and indigenous to this area! oh turquoise, you have stolen my heart! necklaces, bracelets, earnings, you name it, I now own it! 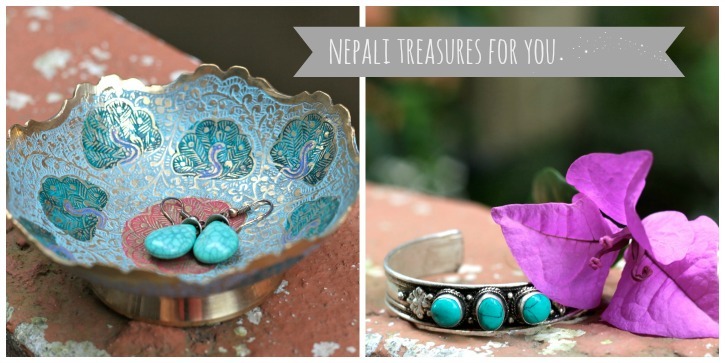 Turquoise is actually found here in Nepal, so there is an abundance of it. here is the bracelet...isn't it cute? the second item is one that i've NEVER seen before. It's a brass dish that has been hand painted with gorgeous colors. i'm not gonna lie...I loved it so much I bought a bigger version of it to put all my jewelry in! I thought this little dish would be perfect for storing your rings or earrings. You have until Friday, July 19th to enter! good luck! ...and exactly a week from tomorrow Kev and I leave for Europe for Paris! ahhh summer romance in paris, I love you. So, I "like" you and I "follow" you and I agree with you--for the most part, I detest all souvenir type stuff. But once in a while you find something great. One my most treasured pieces of jewelry is a brass bangle from Cambodia...and all of my tablecloths are batik cloths made locally in Malaysia, I love that they're so practical and they add bright colors to my home! oh my goodness. YES YES YES! i am in love with anything turquoise but can only really find it at a local indian shop in town (cutest things by the way) what a great idea for a giveaway! And I just like your facebook page (didn't know you had one!) Yay giveaways! Oh my gosh, those are both GORGEOUS! And you're right i've never seen a bowl like that, truly unique and beautiful. Simply adorable! LOVE LOVE LOVE both the bracelet and the bowl - so unique. Count me as fully entered to win these lovelies :) And so exciting about Paris! Beautiful treasures. Thanks for the opportunity to win. I follow on both GFC and Bloglovin, and like on Facebook. Oh my goodness! These are beautiful! Have an AMAZING time in Europe, Katie! I hope you and Kevin have a magical time there!!! I'm currently at a festival with my family! I'm currently camping at a festival with my family! This is such a gorgeous giveaway...turquoise is my favourite gemstone, lucky for me it's my birthstone too! Oh girl, these are GORGEOUS! Turquoise is one of my absolute favs! I just love it! So lovely, my friend. I could use some Nepali around here. :) Love you! oh my gosh these are gorgeous!! and paris?!?!?! ahhhh so excited for you both. how romantic! Oh wow! PARIS! HAVE SO MUCH FUN! Wow! They are seriously two gorgeous items! And I had to laugh because I have the same exact thoughts on souvenirs as what you described ;) Hope you have a wonderful time in Paris!!!! Ok, Katie, I am following your precise instructions to enter the "give-a-way" Have fun on your trip! these are amazing!! love them! btw, following on bloglovin'! Hi Katie, it is actually Brenda entering the "give-away" under Paul's gmail account! If I end up with one of the prizes, I will tell him it is his Christmas gift to me! i like you and i follow you! :-) and am excited about the work going on! happy travels, love you both! I like you and i follow you. my summer plans don't involve paris, but they do involve adventures in the great state of california!. love you! That bowl is absolutely stunning. I agree with you, most souvenirs are all useless and the same. It's cool to get to know the culture and find things that are unique to the area. I brought back an amazing silk tablecloth from silk harvested in the province. Things like that are much more special. I follow you finally! Wow, that bowl is GORGEOUS!!! Love it so much! I follow you on all the social networks! : ) Love the bowl and bracelet! Hope you have fun in Paris! Our Summer plans include the big move to Spain and a trip to Sicily to visit my family. Yay for summer travel! I love turquoise! That bracelet would match my turquoise earrings from the Zuni Native American tribe. Oh that bowl and that bracelet are absolutely gorgeous. I can just see my mom now drooling over that bowl haha! But the bracelet... I think I'd have to keep that haha! Thank you so much for hosting this awesome giveaway!! P.S. I liked your page on Facebook with my fake Facebook account, Noelle Jameson. I still haven't joined the Facebook trend. Mmmmm girrrrl that bowl has my name all over it. i just found your blog last week...i read so much that first night i feel like i know you and your husband!! forgot about it till again tonight, and worried i wouldn't be able to find it again [you know how late night blog hopping goes ;)]...but i found it again!! yay!! love everything that you and your husband are doing. from the neighborhood in the US that y'all ministered to....to nepal!! so inspiring and really making me think about how i want to live this one precious life i have been given!! anyways, how could i not enter this give away??? so beautiful. following y'all on fb and blog lovin...now i'll never worry about losing y'all again!! blessings to you and yours this evening! found your blog last week and spent so much time reading that i feel like i truly know you and your husband!! i forgot about it till tonight when i started thinking about y'all....worried i wouldn't be able to find your blog again [you know how late night blog hopping goes! ;)] love loved reading all about how y'all loved and served people in y'alls neighborhood ...and now in nepal!! amazing. making me think a lot about how i want to live my one precious life i have been given!! blessings to you and yours tonight! Aww, both are so beautiful! I am already following you and liked you on FB! Yay!! I just found your blog through eat.live.make. I love it!! Beautiful story, beautiful pictures!! I subscribed and I would LOVE to add the Nepalese turquoise to my collection!! ummm YES PLEASE!!! I never win giveaways but for this one I will try! love you and so excited for your next adventures!! C'est beau, Paris en été! Bon vent! Paris in the summer - how beautiful! Happy travels! What beautiful things! The detail on the bowl is incredible! Thanks for serving the people of Nepal for Jesus! I love reading your blog! The items are beautiful! Thanks for the chance to win. Enjoy your time in Paris! Loving those!! Can't believe the detail, I just love turquoise! Thanks for hosting this giveaway girl! oh my word!!! I love these both to pieces!!! I have a turquoise ring that i inherited from my grandma and it is very dear to me! I buy souvenirs, but not your typical touristy pieces of junk. Instead I look for jewelry that reflects local culture, scarves, local paintings, etc. I really like things that reflect the country I got them from without being super cheesy and something I would never display! Gorgeous items by the way! These are both so pretty! I too am a big fan of turquoise these days. these are such gorgeous pieces! i especially love the bowl. the details on that are amazing! Ahhhhhh I love I love!! Maybe I'll win? Haha most likely not I have the worst luck with these things but thought it would be fun to enter anyway!! I'm following you on all of those places you said to, and I just liked you on Facebook :) love ya pretttly lady!!!! Those are absolutely beautiful! I already follow your blog and I just liked the Facebook page. :) As an ESOL teacher working in a couple of cities in upstate New York, I've had the blessed opportunity to build relationships with Nepali/Bhutanese little one and high schoolers and I absolutely love it. I love reading about your adventures in my kiddos' homeland!! Blessings to you and Kevin...what an amazing work you are doing!! Stunning! These are definitely beautiful souvenirs. I spent 3 weeks in Nepal about 10 years ago when my sister was there in the Peace Corps. I returned home with some amazing treasures...both in memories and unique souvenirs. It's been so fun following your journey through your blog. Blessings to you both! Stunning! These are definitely beautiful souvenirs. I spent three weeks in Nepal about ten years ago when my sister was there in the Peace Corps. I returned home with some amazing treasures...both in memories and unique souvenirs...as well as a Nepali brother-in-law. Ha! It's been so fun following your journey through your blog. Blessings to you both! Love this! I'm following you in every way possible. Just found your blog through your guest post on FTAT and I'm obsessed. So excited to read about all the Lord is doing through y'all! I'm obsessed with all of this!!! !